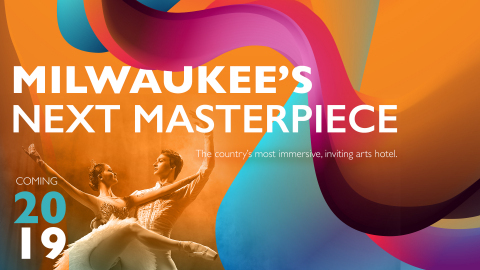 MILWAUKEE--(BUSINESS WIRE)--May 15, 2018-- Excitement is building for Milwaukee’s newest downtown hotel focused on celebrating the arts. It was announced today that architecture and interior design firm Stonehill Taylor, based in New York City, and branding agency One Design Company, based in Chicago, will be tasked with reinventing the 221-room InterContinental Milwaukee, owned and managed by Marcus® Hotels & Resorts, into an immersive arts-focused hotel. The hotel will stand as a community hub with an original, boutique-hotel aesthetic and one-of-a-kind look reflective of the city’s diverse arts community. One Design Company will oversee the development of the hotel’s brand concept, including name, logo, identity systems and more, while Stonehill Taylor will spearhead the interior design for the reimagined hotel. Currently immersed in the initial research phase, both teams are collaborating with Marcus Hotels & Resorts to explore Milwaukee’s creative scene and institutions by taking in exhibits, meeting with artists and viewing performances, while also talking with visitors and residents alike about what stirs their imagination. To stay up to date on the latest happenings surrounding the new arts hotel, please visit:http://www.marcusartshotel.com. Stonehill Taylor is a hospitality-focused architecture and interior design firm based in New York City. For each project, the firm seeks out the essence of the location to create an inspired and distinguished approach. The firm’s high-profile portfolio ranges from interior design and renovation, to new building construction, adaptive reuse and historic preservation projects, and includes: TWA Hotel, The Whitby, Moxy Times Square, Ace Hotel New York, The Refinery Hotel, The Asbury Hotel, InterContinental Barclay and Paramount Hotel’s Diamond Horseshoe. Stonehill Taylor is at the forefront of innovative sustainable design, developing projects that are conscious of their impact on local communities and the world such as: The Crosby Street Hotel, The NoMad Hotel, and Portland’s Press Hotel. For more information, visit: www.stonehilltaylor.com. One Design Company is an independent research-driven design consultancy focused on the intersection of communication, experience and technology—where powerful brands come to life. Through user-centered research and cross-disciplinary collaboration, One Design creates beautifully functional, meaningful solutions designed to solve the complex challenges facing modern businesses. The studio has created communication strategies, brand identity systems, and a wide range of digital experiences—from websites and applications to comprehensive software solutions—for a global roster of clients spanning a wide range of industries including hospitality, food, entertainment, architecture, construction, technology, healthcare, manufacturing and beyond. For more information, please visit: https://onedesigncompany.com. Marcus Hotels & Resorts, a division of The Marcus Corporation (NYSE: MCS), owns and/or manages 20 hotels, resorts and other properties in the U.S., with another property opening in El Paso, Texas in June 2018. The company’s distinctive portfolio includes city-center meeting hotels, upscale resorts, historic properties, and premium branded and independent first-class hotels. Marcus Hotels & Resorts is an approved operator for all major lodging brands. A leader in the hospitality industry since 1962, Marcus Hotels & Resorts creates asset value for hotel owners through its expertise in management, development and product repositioning. This includes hotel food and beverage concepts developed by its Marcus Restaurant Group, featuring premier brands such as Mason Street Grill, ChopHouse, Miller Time Pub & Grill and SafeHouse Restaurants. For more information, please visit: http://www.marcushotels.com and follow the company on Facebook and Twitter (@MarcusHotels).